Hopping down a pink path! 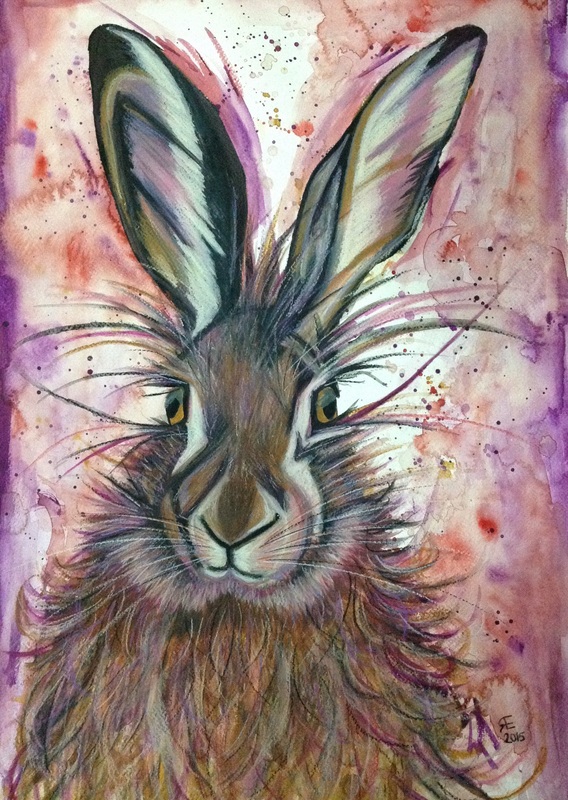 i have had quite a busy week painting, after posting my happy Easter hare/ rabbit, I was asked if I could paint something similar, but with pink/ purple tones, and much, much larger. I am never very confident with commision pieces, I am always worried that the piece may not be upto the persons expectations. Well painting complete, and new owners are happy, so painting is sold, yippee! Despite being poorly and not able to attend the hospice auction of paintings ( which included my hare stare oil painting) I was told it sold for more than I had expected, and had a number of bidders.The evening apparently went well and plenty of money was raised in the process. This entry was posted in 20x20 auction, commision, Hare, neolor, watercolour and tagged 20x20 auction 2015, commision, Hare, neocolor, oil painting, watercolour. Bookmark the permalink. 2 Responses to Hopping down a pink path! Great painting. It reminds me of the album from Van Dyke parks “jump” with the great song “Opportunity for two” it makes me always happy when I hear it. I just googled the album cover….I love it, such a fantastic cover. Thank you for the likes.